She is the master weaver. Nobody can deny it. While some may have cringed at the thought of reaching their twilight years, fearing helplessness and disability and thus branding it as robber of the so-called artistic creations, Fu Yabing Caturan Masalon Dulo, a Blaan master of mabal tabih does not. She continues to hone her skill by simply putting it into full use. At 94, she is living her life to the fullest still teaching and weaving her way despite her age. She is Fu Yabing to her community. Children and the elderly alike fondly call her by that endearment. Fu is a Blaan term which means grandmother. To her teaching the craft to young ones while continuously doing the art of weaving has never been better even as old age has taken a toll on her overall health prompting her then to discontinue her weaving class. She has lost the agility that her young body may once exudes as a result of her progressing age but mind you she has never lost that quirk of a skill that’s innate in her in the tabih weaving department. Learning the craft needs more than the value of patience, dedication, love and loyalty to the art to really be able to follow in her footsteps as master of mabal, the abaca weaving process, Toto Tirando, Sarangani’s Sulong Tribu project manager said. Today, Fu Gusiye Buan, 84 is helping Fu Yabing in weaving tabih (finished hand-woven fabric), making original designs out of sheer creativity and in an old fashioned way at that. Since, it’s just two of them and considering again their ages, one single weaving take at least two to three months to complete. They also do it manually. “Two months is already very long for this designing stage. The truth is it can be done in two weeks,” Fu Yabing told grandniece US-based Arjho Carino-Turner in a recent Skype conversation. The weaving process starts from “cutting the abaca plant, stripping and drying its fiber, dyeing, looming and weaving then pressing and softening the finished fabric,” Espejo wrote. 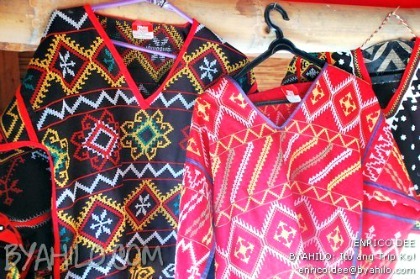 Tabih, according to Arjho “also refers to the traditional Blaan tubular skirt” which the women of the tribe wear. Fu Yabing hails from Amgu-o and Kalyong villages of barangay Landan, Polomolok, South Cotabato. Nine years ago, the cultural master as she is also called came to Lamlifew, Datal Tampal, Malungon, Sarangani and actually lived there for six months to teach the women Blaan mabal weavers for the National Commission for Culture and the Arts School of Living Tradition project (NCCA-SLT), which is a now a popular tourism in the province. The project began during the stint of former Governor Migs Dominguez and pursued by current Governor Steve Chiongbian-Solon under the re-packaged Sulong Sarangani- Tribu Program. Helen Lacna Lumbos, president of Lamlifew Tribal Women's Association (LTWA) who now supervises the SLT credited Fu Yabing for the success of the Lamlifew village in the recent years. She said that demands for the tabih in Malungon have increased. Prices range from P4,000 to P7,000 depending on the length and intricacy of designs. Recently, the provincial government of Sarangani held an exhibit dubbed “Mabal-Blaan Weaving the Threads of Heritage” showcasing the Lamlifew Village Museum at SM City Events Center here. In that exhibit, Fu Yabing accompanied by Fu Gusiye also demonstrated their unique style of craftsmanship and untainted talent so rare to see in this day and age. Both the provincial government of Sarangani and the Department of Tourism (DOT) XII hope to preserve the Blaan mabal weaving and sustain its gains in the next years beyond.